I commence my Frederick Douglas Boston journey on Phillips St, and long for my bike. Mine is blue with upright bars for better sightseeing. Sigghhh. 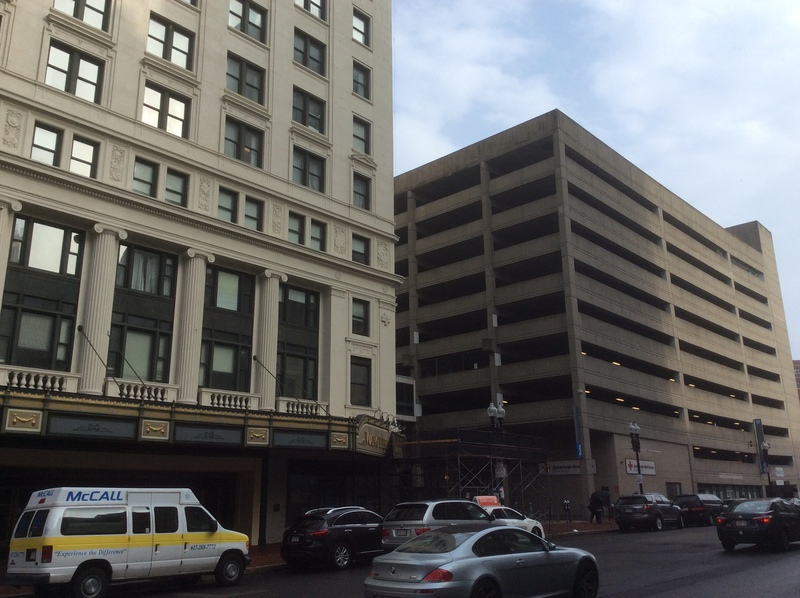 As I’m quick to discover, parking is at a premium in central Boston and its environs. I’ve decided not to pay the high garage rates and stick with metered parking (reasonably priced but harder to find). It’s to be expected in an awesome, busy, historically important city, of course, just be prepared! It’s such a handsome city, so much to look at, and I long for my bike: fleet, nimble, with uninterrupted view, parkable anywhere there’s a pole. At times such as this, a car feels like little but an expensive burden. Frederick Douglass never did live here in Boston, but this city has many connections with his life: he and his family lived just a few miles north of here in Lynn from 1841-47. Douglass visited, worked, and spoke here often, and the Boston Anti-Slavery Society published his Narrative which, combined with his speaking tour of the British Isles and the United States that followed, catapulted him to fame and made him the leading African American abolitionist of his time. In November of 1861, the Emancipation League organized in Boston, where Douglass, the followers of Gerrit Smith (who influenced Douglass to reexamine the way he interpreted the Constitution) and the Garrisonian abolitionists formally reconciled so they could rally and unite their efforts in the cause of the Civil War cause for national union and the end of slavery. Try as I might, I’m unable to locate any exact addresses where they assembled, though I find many newspaper accounts from the time announcing their meetings and relating their activities in Boston and elsewhere. These activities included petitioning the Senate to commence emancipation efforts in earnest. 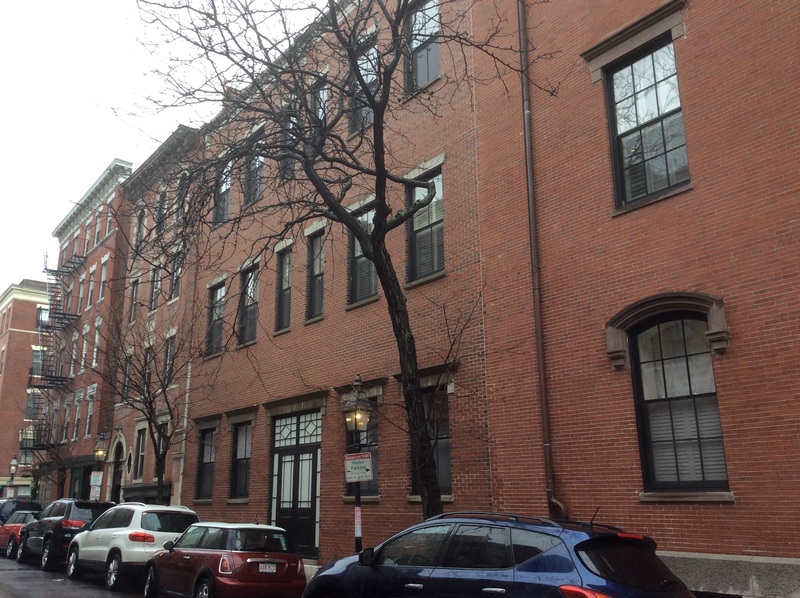 I begin my day’s journey by heading up Beacon Hill, where many of Boston’s abolitionists and black people settled, to 43-47 Phillips St, one block north of Cambridge between Grove and Anderson. I start here for efficiency’s sake since it’s right up the way from the coffee shop where I’m marking out my map with some new details I’ve just learned. However, it doesn’t make sense to start my story here since what happens at this site is the second part of a two-part event, so I’ll tell you about it shortly. Then I head east on Phillips, turn right (south) on Irving, left on Myrtle, left on Joy, to Smith Court which heads off to the left from Joy St between Cambridge and Myrtle. 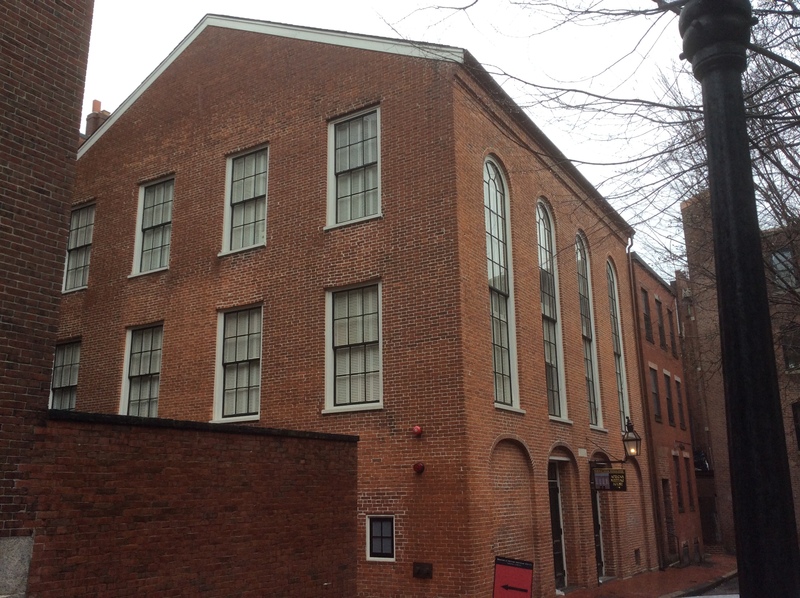 The African Meeting House stands at the end of Smith Court just behind the Museum of Afro-American History at 46 Joy St. 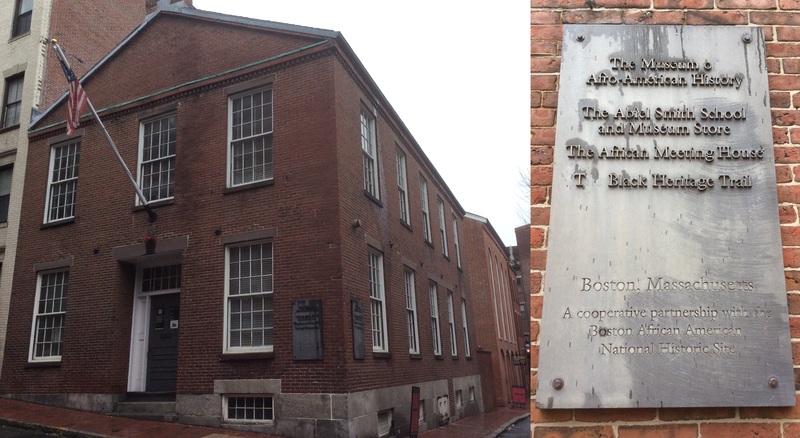 The Meeting House was built in 1806 ‘…to house the first African Baptist Church of Boston (a.k.a. First Independent Baptist Church) and it is now the oldest extant black church building in America’ according to the National Park Service, which maintains it and many other Black Heritage sites here on Beacon Hill. Douglass, William Lloyd Garrison, Wendell Phillips, and Sarah Grimke all spoke here at the African Meeting House, and for those in this list of people I haven’t talked about yet in my account, they will feature later on. There’s a guided tour you can take in season (I’m here too early in the year for that) or the self guided tour. I wish I had another day to visit all the site, including the guided tour of the Meeting house which is actually available today but I’d have to wait till the next available time (which, sadly, I run out of). 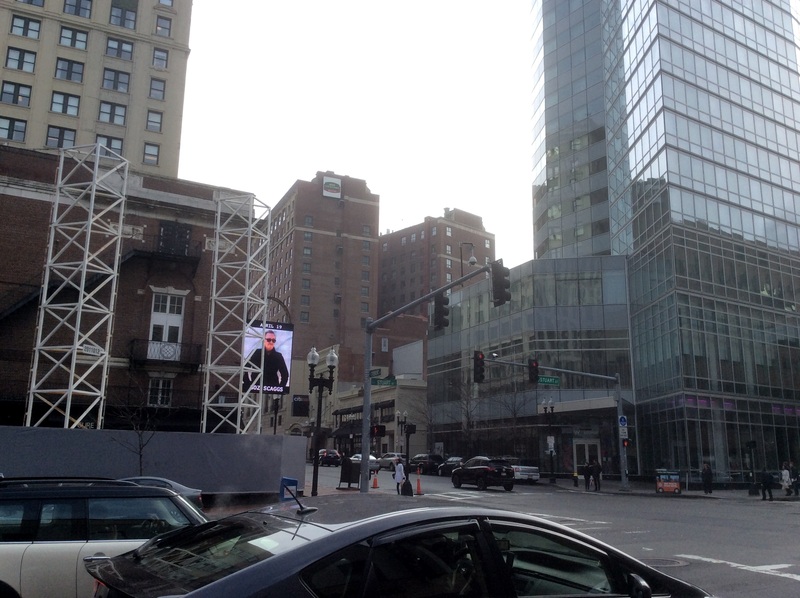 Next time I’m in Boston…! There are a great few things about traveling to historical places in the off-season: the crowds are light and you can get better pictures, it’s cheaper to fly, and it’s a bit easier to park (the fact that I can hope to find street parking at all is pretty good, and I didn’t get a ticket either time my meter expired). 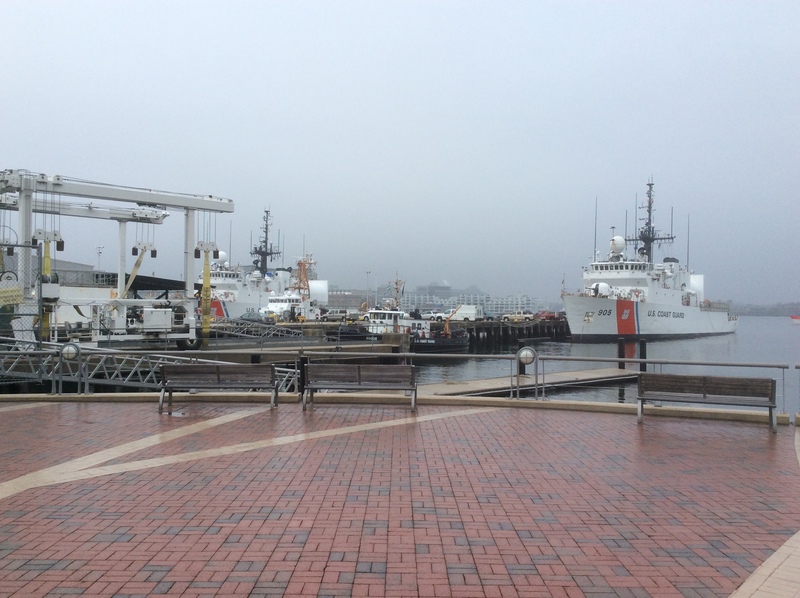 But, the weather can be iffy, the trees are bare, and some places are closed or have very limited hours. So, you have to decide if the trade-offs are worth it. 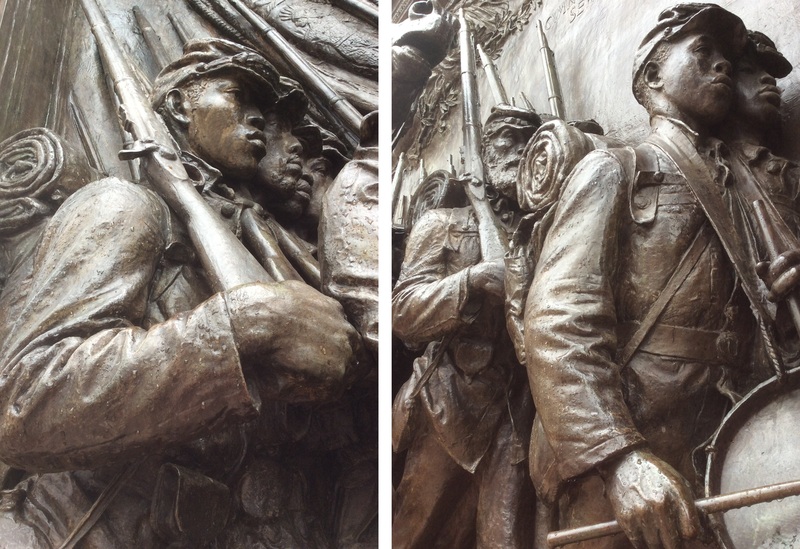 Two closeups of the 54th Regiment Memorial at Boston Common. What determination is expressed in these sculpted faces! Then I turn back and head south to Boston Common, to the 54th Regiment Memorial on Beacon St at Park, near the park’s northeast corner. On May 28 1863, the Massachusetts 54th Infantry Regiment of 1000 troops marched triumphantly into Boston Common. It was the first black regiment to be raised in the North. As discussed in my post from yesterday’s travels to New Bedford, Douglass was instrumental in the fight to get Abraham Lincoln to authorize and federally fund black troops’ enlistment in the Union Army, and Douglass’ two sons Lewis and Charles enlisted to fight in this regiment. What a proud papa he certainly was! The 54th Regiment continued their march from Boston Common on to Battery Wharf (which I will also do soon), passing the site of the Boston Massacre. 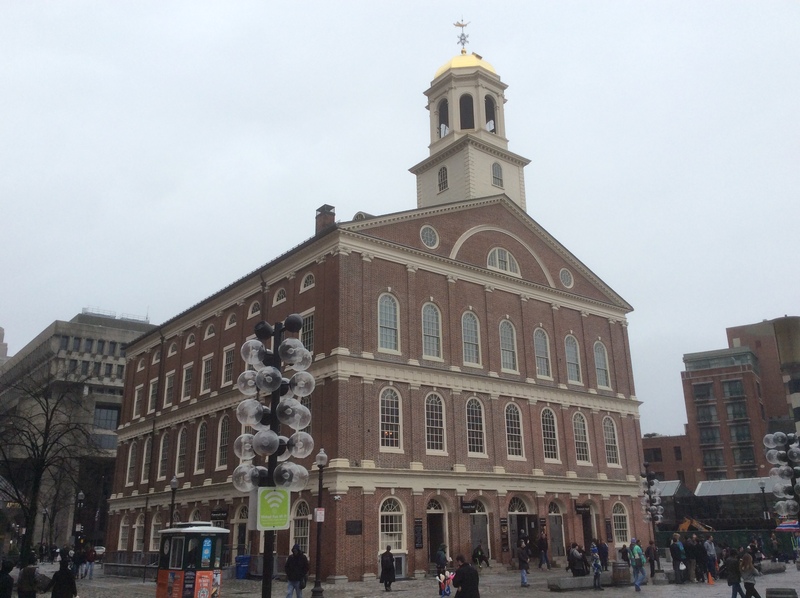 That incident, where a colonial mob dared British guards to fire on them until they did, happened outside of the Old State House, at Congress, Court, and Washington Sts. (John Adams successfully defended most of the British soldiers. Though he was as ardent a patriot as you could find, he was also a man of high integrity and made the legally sound argument and fair point that if a large mob attacks a small number of armed guards, they are duty bound to defend themselves, whatever side they’re on. 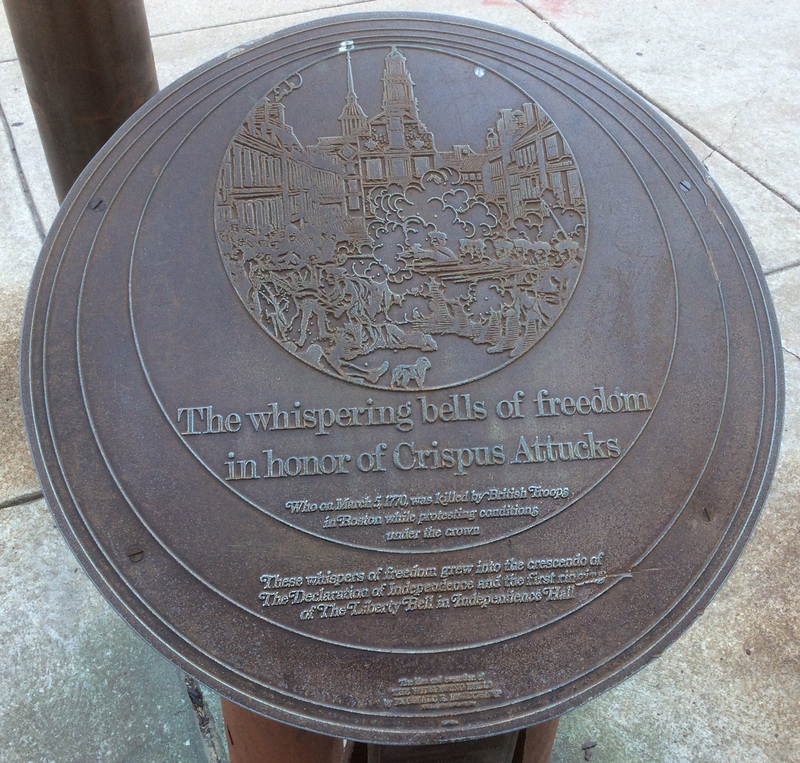 Crispus Attucks, a man of African and Native American ancestry, was mortally wounded in that scuffle 0n March 5th, 1770, and is often regarded as the first American casualty of the American Revolution. When I passed by Philadelphia’s African American Museum a few days ago, I snapped a photo of his memorial plaque there, knowing I would soon visit the site of his death. Back to the story of the 54th Regiment: Douglass was also active in recruiting efforts, believing that enlistment in the Union army, made possible by the Emancipation Proclamation, would give black people their chance to prove themselves as the strong, brave, patriotic, true Americans he knew them to be, and their participation in the war would establish their full right to citizenship once and for all. Unfortunately, black soldiers faced unfair and degrading treatment in the Union Army: lower pay than whites, less weapons and equipment, no chances for promotion, assigned the most dangerous and menial jobs, and so on. Many black soldiers, joined by the 54th’s white commander and son of wealthy Boston abolitionists Robert Gould Shaw, refused pay until it was equal, which was granted the next year. The South also imposed terrible penalties for captured black Union soldiers and anyone leading them: immediate execution, same as for insurrectionists. To his great credit, Shaw accepted no pay and braved the same risk of execution along with the rest of his regiment. In response to the poor treatment of black soldiers, Douglass stopped recruiting for awhile. 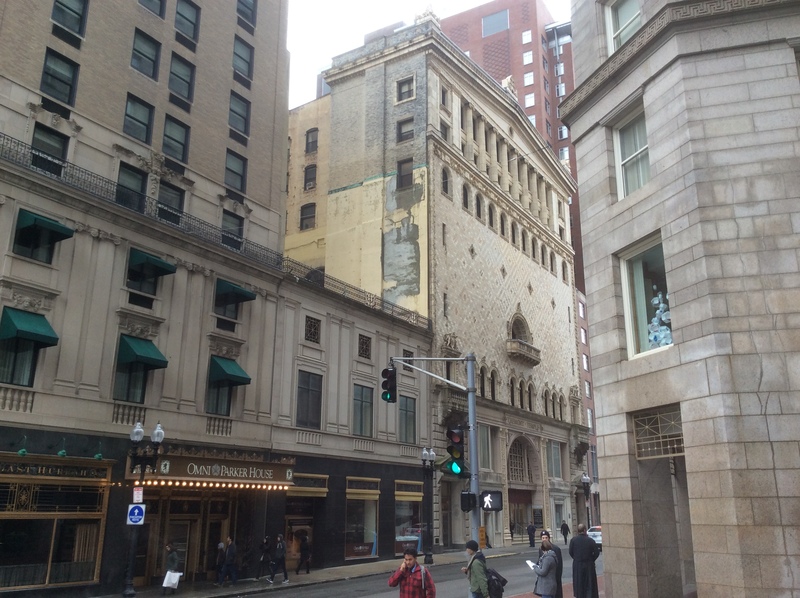 Then I wind my way east of Boston Common to 88 Tremont St, between Bosworth and School, to Tremont Temple. From December 31st, 1862 through the next day’s New Year holiday, Union Progressive Association and about 3,000 attendees, abolitionists, and human rights advocates gathered to greet the official announcement of the Emancipation Proclamation, and Douglass spoke at this event. Douglass had spoken here before, and at one time was roughed up when the recent election of Abraham Lincoln inflamed pro-slavery violence against abolitionists, even in relatively anti-slavery Boston. The Temple structure now here dates to 1896, replacing the original 1827 fire-damaged, much smaller building. Many years later, in 1893 (still in the old building), Douglass’s friend and inspiration Ida B. Wells delivered a lecture on lynching here at Tremont Temple; as discussed in my account of following Douglass in NYC, she inspired his anti-lynching activism later in life. 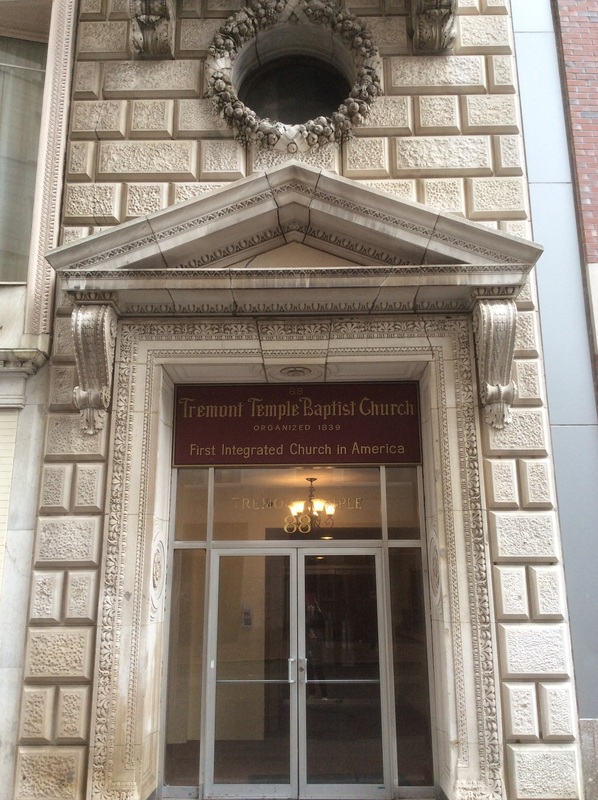 After the Union Progressive Association’s celebration of the Emancipation Proclamation, the party left Tremont Temple, since it closed at midnight, and moved the meeting to Twelfth Baptist Church. After fighting, working, and hoping for such a proclamation for so long, the party was not to end anytime soon, not until the wee hours at least. I’ll backstep a bit here: remember the first site I visited today, on Phillips Street? That’s where the Twelfth Baptist Church (where the Emancipation Proclamation celebration continued) used to stand, founded by former congregants of the African Meeting House, at number 43-47 Phillips St, a little over a half mile away on the other side of Beacon Hill. Then I head a little less than half a mile away in (kind of) the opposite direction of the Phillips St church site to Faneuil Hall at 1 Faneuil Square, where the body of Wendell Phillips lay in state in on February 6th 1884, after his funeral in the Hollis Street Church (more on this shortly, in fact, it’s the last story of the day and the most exciting as a traveling history nerd… ahem, enthusiast seeking a hard-to-find site). Phillips was another great human rights activist, writing in support of women’s civil rights including the right to the ballot box, in an article he published about two years before Elizabeth Cady Stanton famously introduced this same resolution at the 1848 Woman’s Rights Convention in Seneca Falls (we’ll be returning to this story in an upcoming piece). In his Life and Times, Douglass referred to the great abolitionist and reformer Phillip’s eloquence as ‘word painting’, an art which he had performed in life previously in this same hall. Then after moving the car (again!) I head to Battery Wharf, where, as I described earlier, the 54th Infantry Regiment continued their triumphal march to the sea on May 28th, 1863, to travel by steamship to South Carolina. Seven weeks later, about a quarter of their number and their commander Shaw died in a bold and bloody assault on Fort Wagner. Though that battle was lost, the heroic example of these soldiers inspired many others to enlist, and Shaw’s body remained buried in a common grave with many of his soldiers. The Confederates who buried Shaw this way saw it as an insult, since officers were generally accorded their own burial with special honors, even by the enemy. Shaw’s abolitionist family and the soldiers inspired to join by the Fort Wagner fight, however, thought this manner of burial a great honor, and a testament to his courage as a soldier and his devotion to his men and the cause of human rights. I make the long walk south and a bit east, about a mile and a half, to the Citi Performing Arts Center. 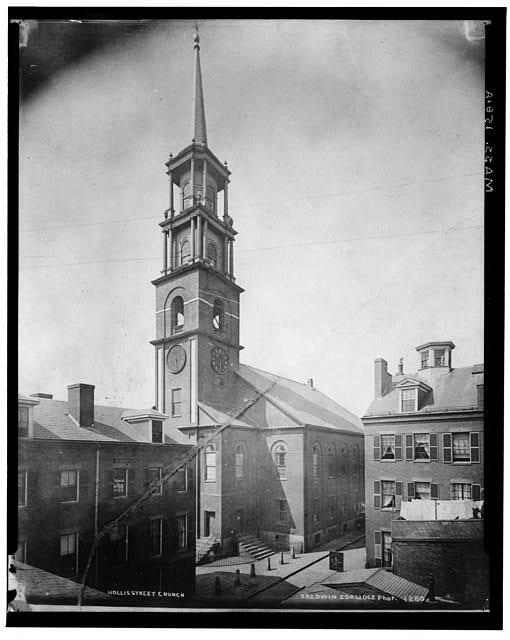 I’m seeking the site of the old Hollis Street Unitarian Church, where Wendell Phillips’ funeral took place prior to his lying in state at Faneuil Hall. This site took me far longer than any other site to find. I had scoured through old newspapers and finally discovered that his funeral was at ‘Hollis-street chapel’, certainly Hollis Street Unitarian Church, according to a Feb 16th 1884 edition of Washington D.C.’s The Bee. I found the entry in Chronicling America, an absolutely invaluable online resource for the history enthusiast on the go, an archive of old newspapers hosted on the Library of Congress website. (When fact-checking later, I find a secondary source that confirms this, based on another newspaper in an archive available only through a paid subscription. To continue the story of Wendell Phillips’ funeral, which Douglass attended on February 56th, 1884… He was not alone: he was accompanied by his second wife, Helen Pitts Douglass, who he had married just that January. Helen was white, and even many of their closest friends and family couldn’t deal this fact, as we’ll discover more about later in this series. Even at this church packed with Phillips’ and Douglass’ most progressive, ardent, life-long abolitionists and human rights activists, no one would dare to be the first to sit next to them until… who other than the most beloved author of my youth, Louisa May Alcott. Alcott’s show of friendship and solidarity warms the deepest parts of my heart. I read every single Alcott novel I could get my hands on throughout my girl- and young adult-hood, over and over again. As it was and still is for so many young people, especially girls and women in the English speaking world, she was one of my primary early influences, one who helped set my moral compass more than just about anyone or anything else. I expect to find little here today, since the history of the church reveals it’s no longer standing, but I made the trip and spend some time poking around anyway. Because that moment at Phillips’ funeral is so beautiful to me, I’m doing to dig deep. Clearly, from the name, the church was on Hollis St; trouble is, there’s no longer a Hollis Street according to Google Maps, the print maps I have with me, or anywhere else online. 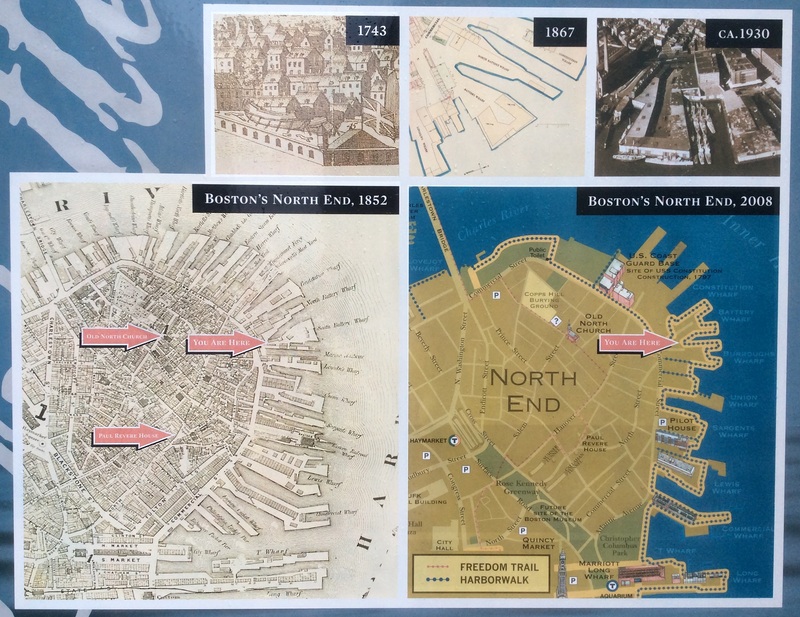 Poring over old city atlases earlier today, I at last discovered where Hollis Street used to be. 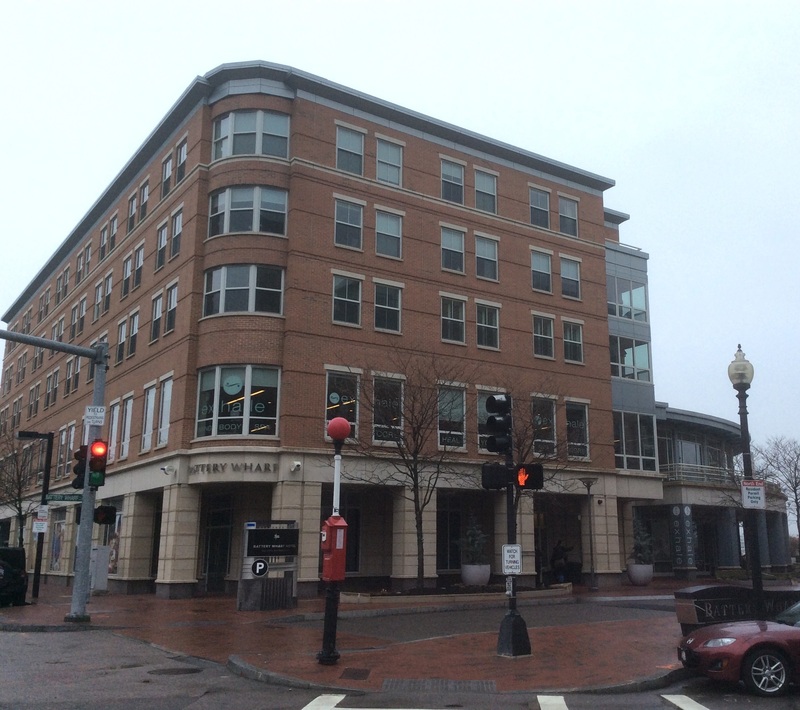 It seems that stood about where the Tremont St garage is now, just south of the historic and grand Wang Theatre of the Citi Arts Center and Tufts Health Sciences campus behind it. 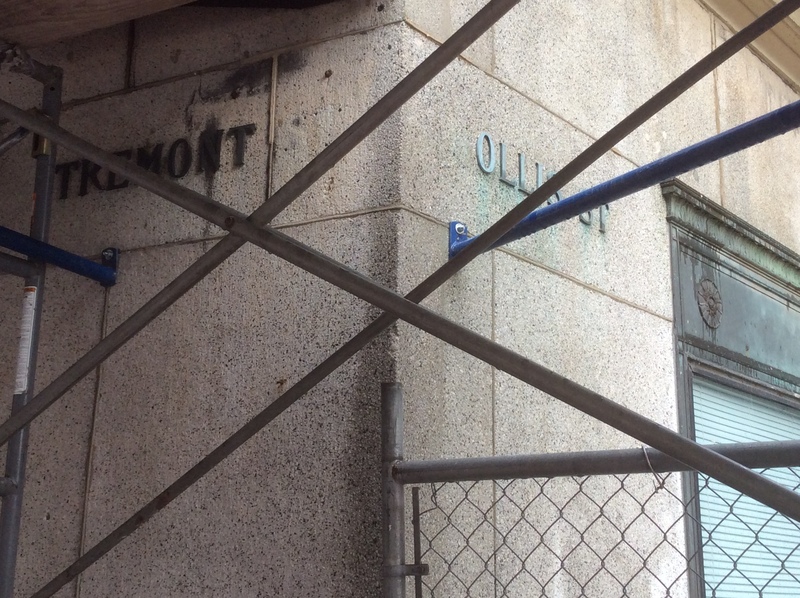 More specifically, Hollis St used to connect Tremont and Washington Streets halfway between Kneeland and Oak. I also discover that Hollis Street Church became Hollis Street Theater in 1885, after the congregation moved to a more spacious location the year after the funeral. 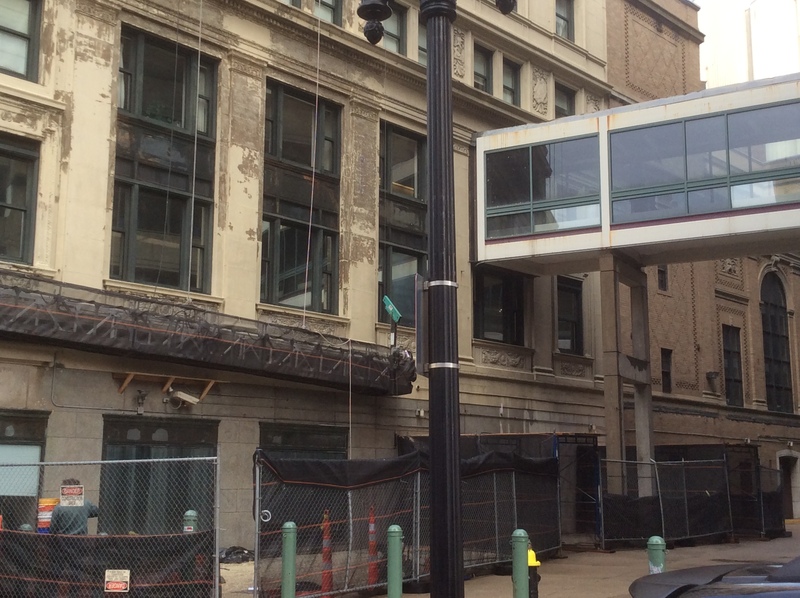 I poke around, and walk up and down the walkway between the Wang Theater and the garage. 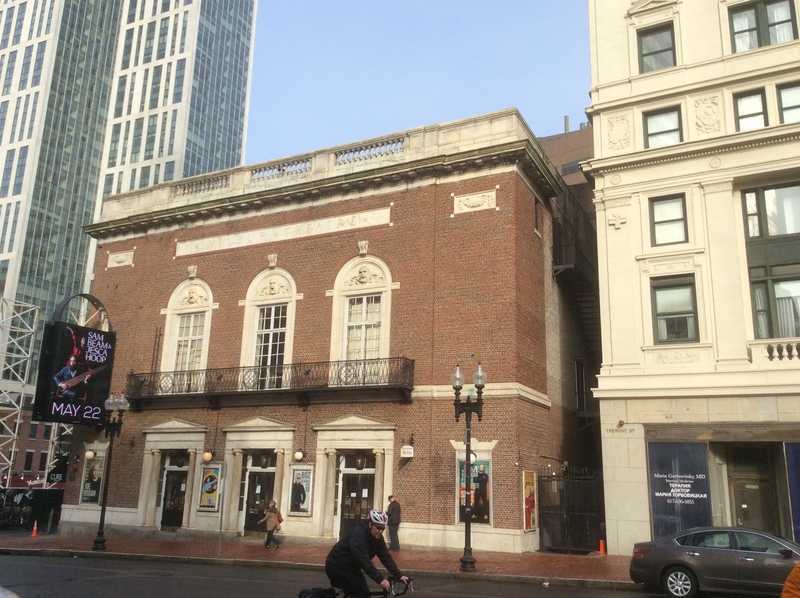 Could the Wang Theater be standing on the site of the old Hollis St Theater? I notice that the front of the Wang Building differs in motifs and materials than the wide of the building. 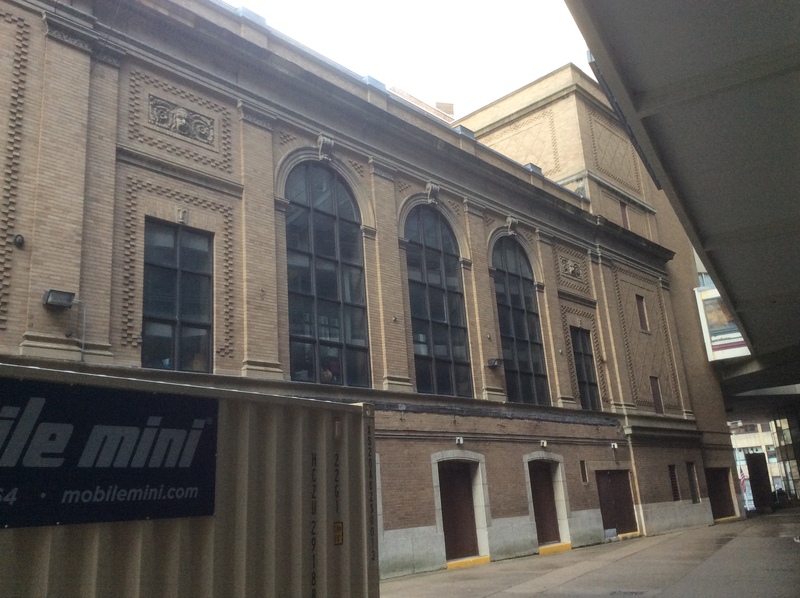 It occurs to me that possibly, a building already standing here may have been incorporated into the Wang Theater. Could there be remnants here of the old Hollis Theater, once the old Hollis Street Unitarian Church where the funeral was held? In researching the history of the Wang Theater, formerly the Metropolitan Theater, I find no evidence of this; by all accounts this grand theater was built entirely in 1925, and the photos of the old Hollis Street Church show a very different looking structure, though looking at the half-windowed bottom parts of the two buildings (see photo below and at the end of this piece), there are some similarities. Too bad, that would have been a great find! 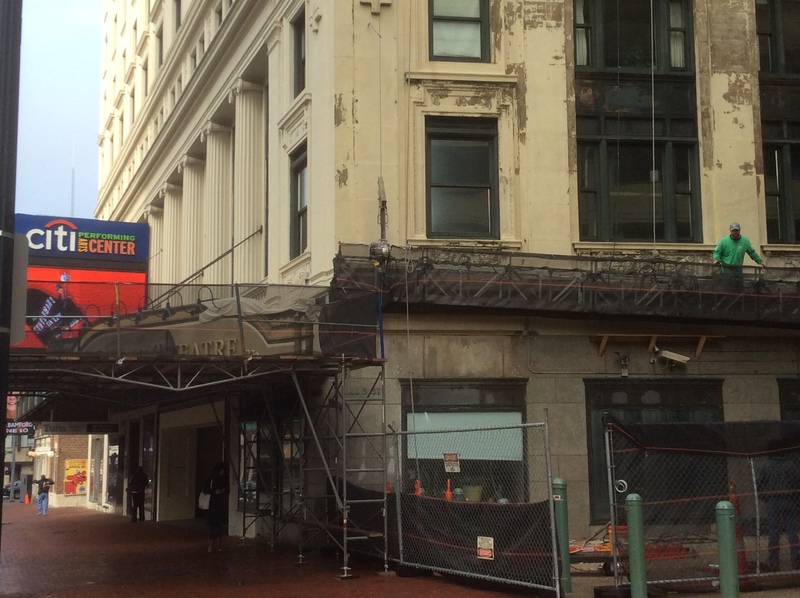 But in a moment of good luck, as I’m scanning the building and the area surrounding it for any evidence of older structures, I spot something among the scaffolding that wraps around the front and south sides of the Wang Theater as its south end it undergoing some maintenance. Near the corner of the building are old brass letters which spell out ‘Tremont St’ on its west side and ‘…ollis St’ on the south. My heart skips a beat. Here it is: confirmation that this is where Hollis St was. We can see what the church looked like inside from an old photo I found online. But more importantly for my purposes here, the Library of Congress has a photo of the church ‘taken from the Northeast’. If that description is right, then it seems that the church stood not where the Wang Theater does but across from it, somewhere under where the Tremont St. Garage stands now, with its side facing Hollis (as you can see, it opens onto a square rather than the street) with its steepled front facing towards but not onto Washington St, and its back to Tremont. This last discovery, successfully triangulating the location where this beautiful moment of true friendship, of love and sympathy overcoming prejudice, makes me feel very emotional and celebratory. My friend recommends The Lower Bottoms, a place that pours excellent ales, so off I go as the sun sets. Many more adventures and exciting historical discoveries soon to come, as I continue to follow Douglass north… come on back, y’hear? ‘54th Massachusetts Infantry Regiment‘. In Wikipedia, The Free Encyclopedia. Cutter, William Richard and William Frederick Adams, eds. Genealogical and Personal Memoirs Relating to the Families of the State of Massachusetts, Volume 4. New York, 1910. Daily National Republican. (Washington, D.C.), 12 Jan. 1863. Chronicling America: Historic American Newspapers. Lib. of Congress. Evening Star. (Washington, D.C.), 07 Feb. 1884. Chronicling America: Historic American Newspapers. Lib. of Congress. ‘History of the Old State House Building‘. The Bostonian Society (website). ‘Hollis Street Church‘. (2016, March 23). In Wikipedia, The Free Encyclopedia. 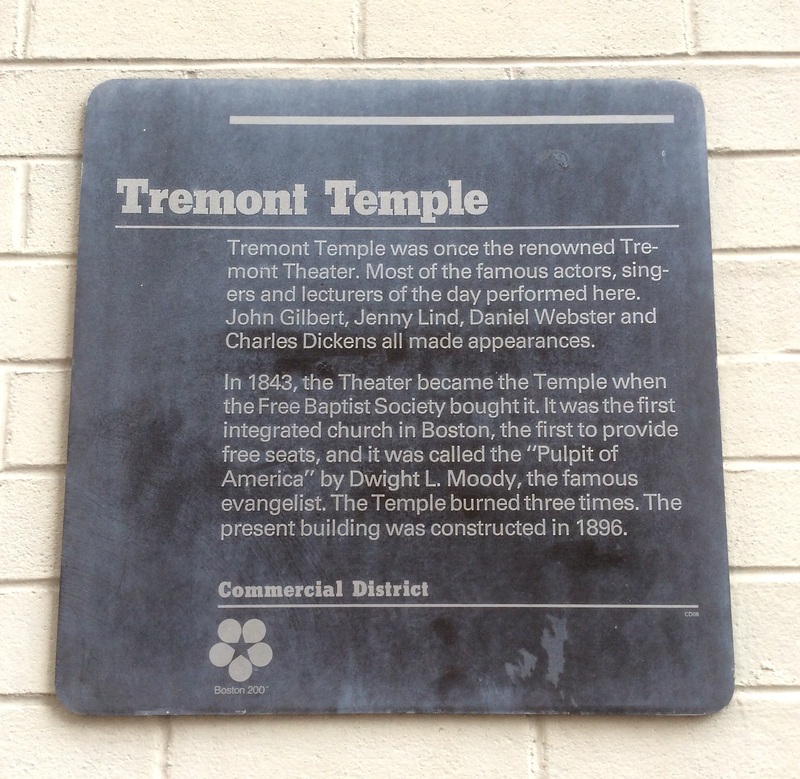 Tremont Temple. In Wikipedia, The Free Encyclopedia. ‘Wendell Phillips‘. In Wikipedia, The Free Encyclopedia. 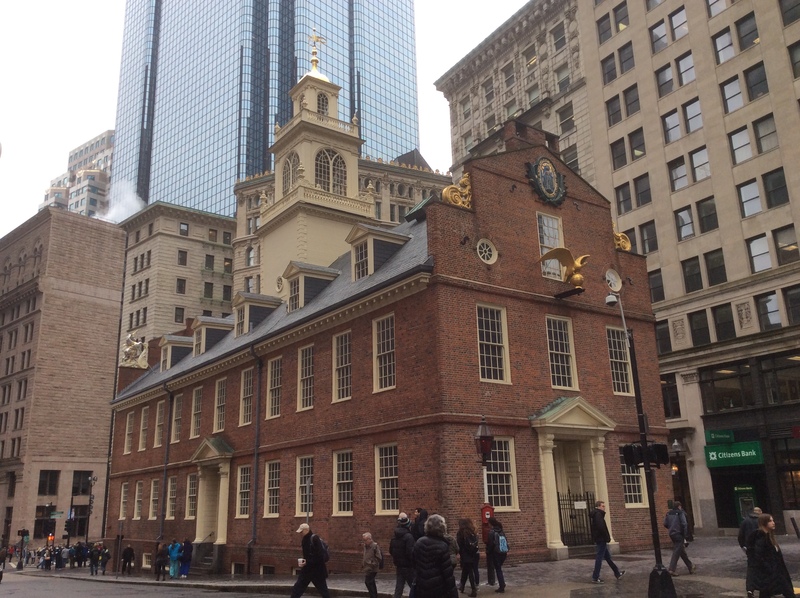 ‘What was the Boston Massacre?.’ John Adams Historical Society (website). This entry was posted in History of Ideas, Human Rights, Traveling Philosophy / History of Ideas, Written by Amy Cools and tagged 54th Regiment Memorial, Abolitionist Boston, Boston Anti-Slavery Society, Boston Common, Citi Performing Arts Center, Faneuil Hall, Frederick Douglass, Hollis Street Church, Ida B. Wells, Narrative of the Life of Frederick Douglass, Tremont Street, Tremont Temple, Wang Theater, Wendell Phillips, William Lloyd Garrison. Bookmark the permalink.